You've seen their ice cream in shops along the street and in grocery stores. You most likely have a favorite out of their frenzy of flavors. You know Ben and Jerry's ice cream, but do you about the inspiring story of Ben and Jerry's? Ben Cohen and Jerry Greenfield met in a gym class which they both hated. They remained friends throughout high school but went their separate ways for college. But getting a higher education wasn't something which proved particularly for either. Ben dropped out of college. Jerry, who did finished college, was unable to successfully get into medical school. In 1978, they took a $5 correspondence course from Penn State University on ice cream making, combined their savings and opened their first ice cream shop in a rundown gas station in Burlington, Vermont. They used an old-fashioned ice cream freezer and began making outrageous, experimental flavors that people were lining up for in the hot Vermont summer. Artistically, it was a success. People loved what they sold. But they barely survived their first year. There were lots of people who were attracted to the company who shared the social values of the company, and in some cases, we had to go out and seek people. It's easy to ask, if they were't business people, or professional ice-cream chefs or people who were amazing marketers...what exactly where they? We'd like to think that as founders, they were the DNA of the company and their chief role was create a vision and inspire those around them. The vision made a big difference between them just being another ice cream store to being a company that was founded on values. The company is dedicated to a triple bottom line: make a profits, take care of it's community and be charitable. It does things you would never expect out of an ice cream store. Ben & Jerry's offers voter registration along with its ice cream, is generous with wages and benefits, and purchases fair-trade Brazilian nuts from indigenous Amazon farmers. But most astoundingly, it donates 7.5 percent of its profits to charity. It is truly remarkable to think that they started their first store in an old gas station and barely even made it past their first year. They had no competitive advantage but their enthusiasm and creativity with innovating on flavors. Although it maybe trite advice, following your passion has its merits. There will be peaks and valleys in your business, but the one undeniable thing you need is persistence. Both the founder admitted their weaknesses and proactively sought help where they could. They didn't aspire to get an MBA, learn accounting or delve into supply chain management. They stayed true to their core and remained "the DNA" of their company. From the very first day, they were passionate about their flavors, the company culture and the people who they served. They hired intelligently to expand the vision they set. Their customer service really kept them afloat. Acting like your customers are walking dollar bills is not the way to make your business stick; customers are people and they're the key to your success. 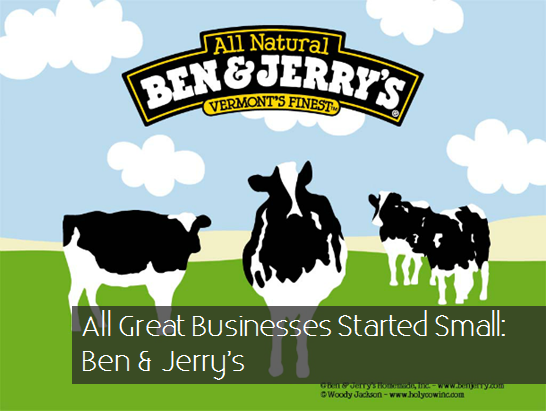 So the next time you're noshing on a pint of Phish Food or Cherry Garcia, think about Ben and Jerry's humble start and where your business could go from here.